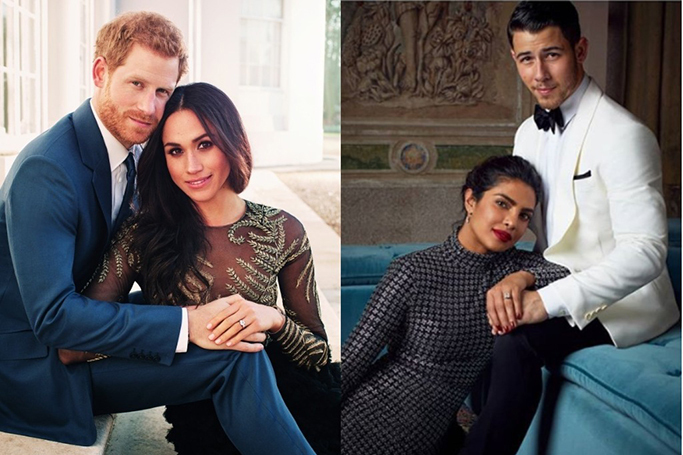 Priyanka Chopra, shares more than style tips and gossip with her BFF Meghan Markle, as it appears the actress was inspired by the Duke and Duchess of Sussex’s engagement photographs –so much so, Priyanka Chopra and Nick Jonas recreated the iconic photo themselves. The photograph of newly engaged Chopra and Jonas was captured by Prince Harry and Meghan Markle’s wedding photographer Alexi Lubomirski, who photographed their engagement pictures as well. Lubomirski was the talent behind capturing stunning formal and informal shots of the royal couple, as he’s now tipped to photograph Chonas’ special day as well. Priyanka Chopra and Nick Jonas were pictured at Ralph Lauren’s 50th Anniversary showcase at NYFW. Mirroring the Duke and Duchess’ pose, Jonas sat on a chair, while Chopra leant on her fiancé and showed off her gorgeous engagement ring –with the same smitten look of Meghan and Harry. Chopra and Jonas announced their engagement last month after a whirlwind romance. Back in May, Priyanka Chopra attended the royal wedding of the Duke and Duchess of Sussex –who can forget that stunning Dior dress she wore to the royal wedding reception?! Meghan and Priyanka are great friends, as we’re pretty sure the couples are currently on double dates and planning the next big day! Will we see a royal wedding part 2?